My mother advised me that Tchaikovsky was ‘chocolate box’ music. Jani Allan grew up in a household where pop music was banned. She was raised on a strict diet of Chopin and Hanon. 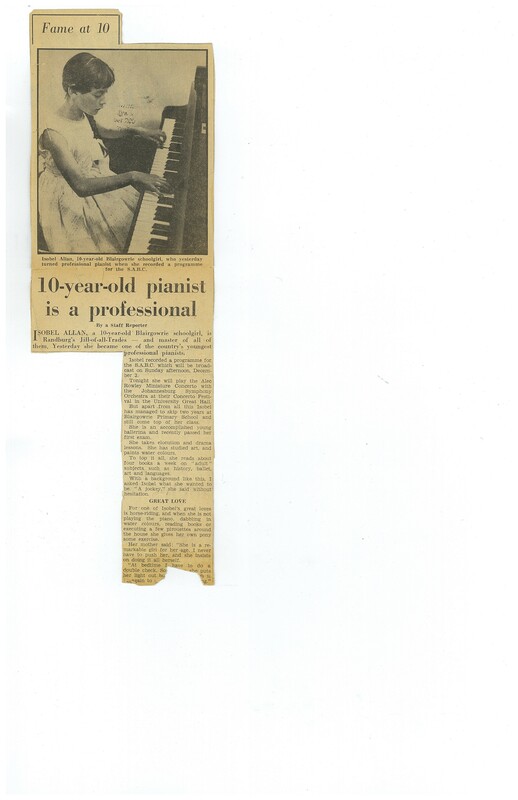 At ten she was a classical pianist and child prodigy. Stan Katz played her the Bee Gees every morning on 702 during their courtship. She set the soundtrack when she returned to South Africa as a talk-show host on Cape Talk. Music expresses the quintessence of life and its events. It is precisely this universality that gives music the high worth that it has as the panacea for all our woes. Forget paracetamol and don’t even think about calling the doctor: listening to Queen’s Bohemian Rhapsody, so they say, is the quick route to feeling better. According to a survey carried out to mark BBC Radio 2’s Faith in the World Week, whose theme was the “healing power of music” in a poll of 1,000 people, nearly 90% of respondents agreed that listening to music can make people feel perkier when they are sick or are under the cosh. Music speaks crescendissimo about the civilisation in which it is birthed. Mozart perfectly reflects the polished perfection of Salzburg. Don Giovanni is a direct reflection of the culture in which it was created. “What is their music?” is the question asked in Close Encounters of the Third Kind. In some way, knowing ‘their music’ enables you to know them. Music’s power, according to Schopenhauer, lies in the fact that in music we do not recognize the copy or repetition of any idea that exists in the world. Music can indeed make you unfold like a flower fast-forwarding in a nature video. My mother was a classical music snob. My first musical memory must be when I put my hand through the mangle of the washing machine. My mother first put Chopin’s Preludes on the record player and then me on her lap. “Listen to that piano playing,” she ordered. Alfred Cortot’s brilliant technique sliced Chopin into lacework which swirled around the room. When I began to play the piano I was astonished to realize that black marks on a staff, when interpreted, could make one’s heart sing or weep depending on the intervals. Perfect fourth. Optimism. Perfect Fifth. Triumph. Minor third. Uncertainty. I would dance around the sitting room in my pink ballet tights and matching pink headband to Tchaikovsky. My mother tolerated it but advised me that Tchaikovsky was ‘chocolate box’ music. The musical equivalent of Tretchikoff. Recently Lana Del Rey sang Once Upon a Dream to the music of Tchaikovsky and all the satin ballet slipper memories came glissando-ing to me. Growing up, I was not allowed to listen to pop music. My days were devoted to two hours of Hanon (for technique) and a further two of practicing the piano. When I was 16, on my way home from a piano lesson, I bought my first seven single. It was “See Emily Play” by Pink Floyd. It was an act of rebellion. After lights out I would listen to John Berks broadcasting out of Lourenco Marques on my transistor radio hidden under my pillow. He played ‘Papa was a Rolling Stone,’ by the Temptations (I loved the way he talked over the opening bars), Matthew and Son and ‘Never my Love” by the Association. Eventually my mother gave up trying to stop me listening to pop and admitted that ‘Obladi Oblada’ was quite catchy. She also liked ‘Eleanor’ by the Turtles. There was a curious innocence in our jorling. When I was sent on assignment to Cape Town there was the thrill – it never grew old – of landing at D.F. Malan, finding a hire car and putting on The Cars ‘Heart Beat’ City. Once I saw George Benson in Cascais. I became quite emotional and had to remind myself to breathe when he sang ‘In Your Eyes.’ That was back in the day. These days I am more Leonard Cohen than George Benson. A Canadian writing the musical narration of the biblical tale of David and Bathsheba. Now that’s what I call music. The most exhilarating music of all was that played at the Last Night of the Proms which is held at the Royal Albert Hall every end of summer. There is wit and funning in ‘Sea Shanties” and gungho British nationalism in Land of Hope and Glory. You’d have to be tired of life not to respond to this music on a visceral level. When I was dating Stan Katz and he was station manager of Radio 702, he would play me a song every morning on his show. It was the Bee Gees – You Win Again. I was sanguine about the country in those days. Write in and share the soundtrack of your life.